If you use a batch water ionizer like the Biontech BTM-3000 or 2G Budget Ionizer, you need to add minerals to get maximum pH and ORP, (unless you already have fairly hard water). 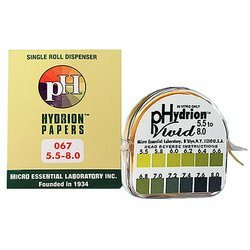 pH paper is used to test your urine and saliva (pH 5.5 to 8). pH drops are used to test the pH of your ionized water (pH 1 to 11) to confirm you're getting the desired ionized water pH. This bundle includes all three items. Fresh And Alive Water Ionizer Accessories Bundle - Trace Minerals, pH Test Paper, & Water pH Test Drops has been added successfully to your wishlist. Concentrace® is a liquid trace mineral supplement which we recommend for adding to ionizer water before ionization to maximize pH. (Harder water like some well waters may not need additional minerals.) For supplementation, we recommend the Ambaya Gold Essence of Life and Super Conductive Ionic Minerals. 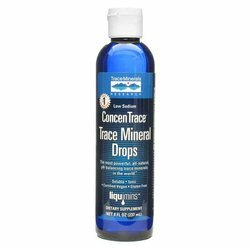 ConcenTrace® Trace Mineral Drops have the same ratio of minerals as the human body, but with 99.5% of the sodium removed in a completely natural process that creates a formula about 26 times more concentrated than any other liquid trace minerals on the market. It's impossible to underestimate the importance of minerals and trace minerals for the human body. They are the catalysts for all the vitamins and other nutrients your body uses for developing and maintaining good health. Why is ConcenTrace® so powerful? Extracted from Utah's Great Salt Lake, ConcenTrace® contains a full spectrum of all the minerals in a balance natural to the body. It is so concentrated, 40 drops (1/2 teaspoon) equals the mineral content of 1/2 cup of sea water without the sodium. It is important to test the pH of every batch of ionized water to ensure you're getting the proper pH. 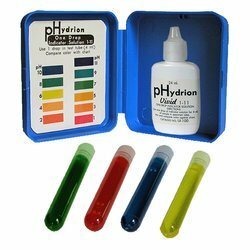 The Hydrion concentrated pH indicator solution will give accurate pH readings from pH 1.0-11.0. Just put one drop of the indicator solution in the 4 ml vial with your sample solution to give a bright, easy-to-read color. Match the color directly to the laminated color chart for quick and easy pH measurement. Colors remain stable for delayed readings. pH papers are a quick and inexpensive way to test your body's approximate pH. Acid-base balance is a fundamental key to health. Papers specifically designed for urine and saliva must be used; papers for swimming pools, etc. will not work. These 15-foot rolls yield about 120 tests and will last typically about 6 months if testing once per day. Beware, some retailers buy large quantities of these to offer low prices, and the stock can be a year or more old, yielding inaccurate results. We do not stockpile inventory, so you're assured fresh accurate test paper. This particular paper has a good balance of range with accuracy, pH 5.5 to 8.0 every .2 to .3 pH intervals. This Hydrion product, commonly requested to test urine and saliva has excellent color separations in the acid range, below pH 7, and the alkali range above pH7, which is sometimes not the case with other papers.